2. it would be something a little more special than a regular discussion post. I broke my first promise, but hopefully it was worth the wait. It took a while for me and Hilton to connect; when we finally did, I was in my old bedroom at my parents’ place, having just travelled for eight hours, and he was waking up from a nap, battling the flu. I had to call him a few times; his outgoing voicemail message says “I am away from my trampoline,” FYI. What a pair we were! I wanted to call this piece “Hilton Als Has A Cold” but Haley said no. What is a White Girl? I think one of the things I was trying to do, with the topic of people…I was missing a lot of people that I was writing about. With a great essay collection, there’s usually an overriding theme, and I realized that when I was writing about the woman Mrs. Vreeland [in the essay “Tristes Topiques”] she had appeared in various works of mine before. There was a little bit of her in Louise Brooks, and for sure at the end of the book. I think it was a way of wrestling with two things, which was missing her, and also trying to identify without naming. In the way that the male characters are named and whatever because they’re black and male, what would that mean if I named a white girl? 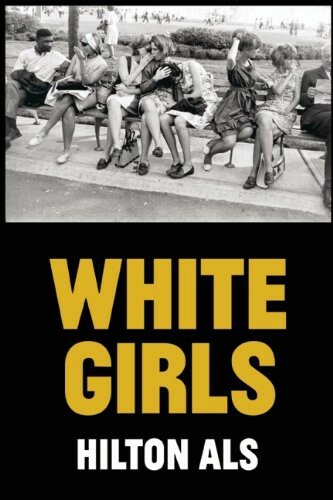 I think one of the emotional things that happens in the book is that I refused to name what the white girl is. Because of resistance to being named myself, you see? And that was what was really happening there, I was really resistant to being named myself, and it was a way of calling somebody something without really being to be able to identify what that something else is. What do you mean by being named yourself? In the book, there’s all this stuff about the two men who were friends really because they’re black, and because it’s assumed that they are strange because they are black and male. So what if a black male targeted another minority? Did I have the power to marginalize someone, you see? I don’t think I do. I think the whole point is to show how it doesn’t work. If you have been targeted, you’re less likely to have the language of targeting others. It’s not fixed. I think there are all sorts of definitions flying around in that book. There’s the section where I describe her and I say, “She was a white girl, whatever that means.” I think that’s significant. You say you were writing the book to reconcile with missing people, particularly Mrs. Vreeland. She doesn’t come in until the end of the first essay, “Tristes Topiques.” Do you see her as the subject of that essay? I think the thing that’s so weird about books is that they’re so fixed, when you change and stuff. I think I’m a different person now. Probably, maybe, I would have kept that relationship more in the forefront of the book. Ostensibly, what I was interested in was the world of black male friendship. I think, to be honest, I was interested in describing feeling jealous and possessive of an object of desire, someone that I wasn’t. It’s hard, it’s a very honest thing to say you always want to be the person that has the attention of someone that you love very much. I was always amazed by her bravery, but also I was very interested in how she was open to being someone’s object of desire, whereas I was, I think, more reticent about that stuff. You write about moments that happened so long ago in such detail. How much of that is based on memory alone? I think that, for sure, a lot of it had to do with memory. Some of it was made up. In terms of just storytelling, I think the feelings are autobiographical. Sort of like trying to write a poem about feelings that are attached to a particular historical time. I envy poets, because nobody ever asks them if it’s true or false. I was trying in some way to get at the aesthetics of poetry, which has everything to do with the momentum of storytelling, but also the selection, the elimination. In some of your other essays, you use fiction to augment and explore people’s experiences. I’m thinking about the one about Richard Pryor’s sister, “You and Whose Army?” How did you come to develop that idea? I’ve been trying to write this fiction about Richard Pryor as a kind of double. In one section I wrote, this woman just came to me because she was very reminiscent of an actress friend of mine, Khandi Alexander, in terms of her voice. She’s a great actress. She plays Mama Pope on Scandal now. A lot of time was spent, when I first knew her, listening to how hard it was and rewarding it was to perform. It was really my first kind of intimate experience with hearing about this woman’s life, and the rewards of it, and how difficult it was for a woman of color. I was very taken with that vulnerability. She’s also mentioned at the end of that piece. I wrote it very quickly over winter. She just really lived to me as a character. I couldn’t get the book together that I was planning on Richard Pryor. But that piece, Dave Eggers asked if I wrote fiction, and I kept saying no the way most closet fiction writers do, but I sent him that and he published it in his magazine. That was a real vote of confidence, that the voice was real. That’s how it really happened. Why did you connect her to Richard Pryor? I wanted a famous person of color who might have had a relationship to her, who was an only child, and who might’ve had a great deal of vulnerability as Richard Pryor did. “What would they have in common?” was the question. I wanted to write about the nature of celebrity in America. What would it be like to be a sibling to someone who meant so much to so many people? There was a line in your piece about Flannery O’Connor (“The Lonesome Place”) that connects to Pryor, where you wrote that she “understood comedy as the flashy side of tragedy.” What do you think about that belief? I think the things that make me better, that I really love, always have that element of being really heartbreaking while playing games with words. I think Lily Tomlin is incredibly artistic on that level, her ability like Richard to wait for the audience to respond. To take things back to what you said about your work being an autobiography of feelings: how important is it to accurately reflect people’s truths in your writing? Just before you called, I was lying in bed dreaming of something I was working on and looking for the more honest way to begin it. I think what we’re attracted to on the page is something that is very difficult to do in life, which is to examine in what seems like a moment. To examine what we can’t do in life very well, which is to be as present and accountable to what an experience is. That’s why life is short and art is very long. I think one of the reasons it takes so long is because we cannot for any reason do in life what we do in art. Art is a second chance to really express how we are.